SSI Schaefer , a company specialising in intralogistics, recently had a ceremony when they started the construction of a modern test and technology centre in Gielbelstadt. 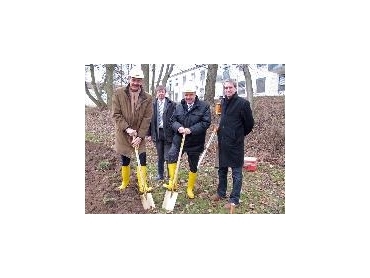 At the company's premises, the managing directors Harrie Swinkels and Rudolf Keller together with Rainer Steinbach, head of engineering and architect Matthias Versbach personally took on the first workings for the laying of the cornerstone. The new building will reach a height of 15 metres. On an area of about 4,500 square metres, the specialist for intralogistics in Giebelstadt wants to explore new technologies and integrate innovations for the development of new, customer oriented products. Additionally, the trend-setting test and technology centre is to be used as a venue for SSIs' successful automation-conventions. With a show room that will be used to present several new products, the new building will also serve as a display area for all divisions of SSI Schaefer. "The new test and technology centre will enable us to concentrate the company-wide innovation and to make the development of market-driven systems more transparent to our customers," explains Harrie Swinkels. "This way we are meeting our customers growing demand for information and are able to give them the possibility to experience modern components of intralogistics first hand." SSI Schaefer plans to have the test and technology centre completed by the European summer.